Systemic lupus erythematosus in children is a life-threatening chronic disease that is being increasingly recognised. More black African children are being diagnosed and the proportion of males affected is much higher than in adult-onset lupus. The presenting manifestations of childhood-onset lupus are variable and many systems are involved. Children with lupus often present late with severe disease, and in South African (SA) children severe lupus nephritis occurs commonly at presentation. The investigations for lupus should be performed in a three-step process - initial essential investigations, antibody and serological tests, and supplementary investigations. The most important factor in the management is to involve a multidisciplinary team as soon as possible. All cases of lupus in SA should be discussed with a paediatric specialist so that a tailored management plan can be made, depending on the presenting features and course of the disease. Systemic lupus erythematosus (SLE) is a multisystem, inflammatory, autoimmune disease characterised by the formation of antinuclear antibodies. It is one of the most common autoimmune diseases, with an estimated incidence of 2.0 - 7.6 per 100 000. '2,31 Because SLE can present in a multitude of ways that mimic other diseases, early diagnosis can be difficult. A literature review from the first author's MMed dissertation was used as the main reference source. PubMed and Google scholar searches were conducted to identify more recent publications. Abstracts from 2014 and 2015 were reviewed and relevant full-text articles were read and cross-referenced. Keywords were the following: Systemic Lupus Erythematosus; SLE; Children; Update; Management; and Autoantibodies. Personal reference lists of the 3 authors were used in this update. Most of the data were either level B or level C.
Who presents with the disease? 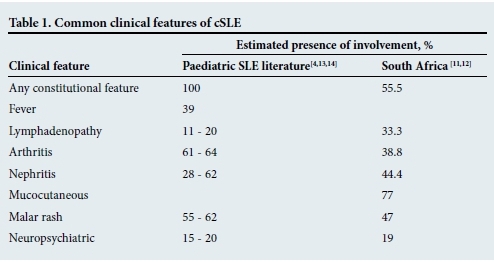 Although more commonly present in adults, childhood-onset SLE (cSLE) is becoming increasingly recognised, with approximately 15 - 20% of SLE occurring before the age of 19 years. [1,4] The presentation of SLE differs, not only with regard to age, but also depending on the ethnic background and gender of the patient. [2,5] The disease has been reported to be more common in Europe, Asia and the USA than in Africa; yet, patients of African ancestry living in these regions have the highest rates of SLE. There is increasing recognition that SLE is not as rare in Africa as previously thought. The discrepancy may be related to many factors, including under-diagnosis due to poor access to healthcare and under-recognition of the disease. The aetiology of SLE is not fully understood. Genetic, environmental, immunological and infective factors are all thought to play a role. '11 It is hypothesised that a trigger acts on genetically susceptible individuals, and complex immune dysregulation of multiple components of the immune system as well as disordered apoptosis result in the production of autoantibodies that are particularly active against proteins in the cell nucleus. Recent evidence is emerging to illustrate the intertwined roles of the adaptive and innate immune system in this disease, and type 1 interferon has been shown to play a prominent role in the development of SLE. SLE is diagnosed clinically and in the laboratory. It is based on the American College of Rheumatology (ACR) Classification Criteria for SLE, which were revised in 1997. Four of the 11 criteria are required to make the diagnosis. These criteria were established mainly for use in scientific research; therefore many children, especially those with lupus nephritis (LN) or antiphospholipid syndrome, might have SLE without fulfilling four of the criteria. How do children with lupus present? Globally, the presenting features differ, which is one of the reasons that SLE can be difficult to diagnose. It remains problematic to establish whether a specific symptom or sign will occur in any individual or any group of patients, although cSLE is known to be more severe at diagnosis when compared with adult-onset SLE. In 2005, a cohort of 36 patients from Gauteng, including 14 black African children, was reported on, concluding that SLE is being increasingly recognised in black SA children. A recent study from Cape Town reports on 68 patients, with a median age of 12.2 years and an approximate female to male ratio of 5:1. The study included a larger proportion of black and coloured patients than previous studies. This cohort of patients presented with severe disease at diagnosis, with most of them having LN. Preliminary findings show these children presenting with high disease activity and progression to end-organ damage at higher rates than in developed nations. Which investigations should be performed? When investigating children with suspected SLE, the ACR criteria may be used to guide the initial investigations. Table 2 gives an outl ine of the investigations in a stepwise pattern. The management of cSLE is difficult and referral to specialists in this field is essential. While there is no single cure for the disease, the aim of therapy at all stages of cSLE is to maximise the therapeutic effect while minimising disease activity and adverse effects. It is important to base treatment decisions on the systems/organs involved and the severity of the disease. SA is still trying to recover from the apartheid system and its inequalities in healthcare provision. Recommendations can be made to offer our children the most appropriate management. All children with SLE should be managed in a specialist paediatric centre, preferably with access to paediatric rheumatologists, paediatric nephrologists and appropriate support staff. A comprehensive MDT is essential. Patients should be assessed individually and their specific needs addressed on a patient-to-patient basis. SLE is a life-long condition with a natural course of chronicity, with disease flares and accumulation of organ damage. Anticipating potential problems and planning for these in advance can help to reduce the impact of the disease on the patient and the child's family. Adolescence is a dangerous time for all patients with chronic medical conditions, and lupus is no exception. There are many potential pitfalls at this time, including non-compliance, recreational drug use, psychosocial issues and pregnancy, which should be addressed. The transitional process through adolescence into adulthood should be carefully planned, with the involvement of the patient, their family and the MDT. Induction treatment should only be given after discussion with paediatric specialists, preferably those with knowledge of cSLE. methylprednisolone (30 mg/kg per dose for 3 days), together with immunosuppressive therapy and disease-modifying drugs. Weaning of the corticosteroid dose must be gradual and supervised carefully by an experienced team. Azathioprine and methotrexate are other options available in SA. They are both used with corticosteroids in patients with mild to moderate disease. Azathioprine is useful in maintenance therapy for patients with LN and can be used to delay the presentation of neuropsychiatric manifestations of SLE. Methotrexate has been shown to be an effective agent in controlling cutaneous and articular manifestations of the condition. 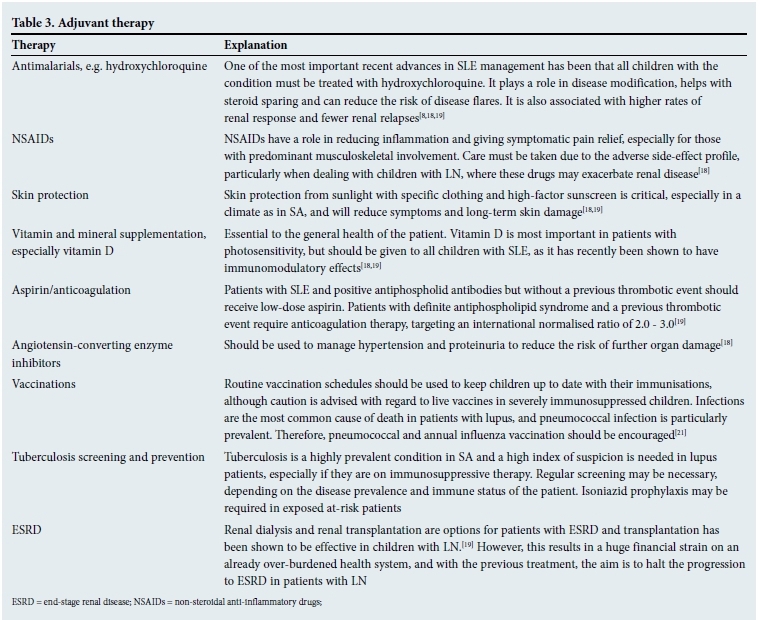 An often overlooked key factor in the care of children with SLE is the importance of adjuvant therapy (Table 3). Disease flares are a common occurrence in cSLE. They should be screened for and managed aggressively according to the severity of presentation and organ system involved. It is important to address compliance, changes in the social situation, as well as patient and family psychosocial well-being. Drug doses should be reviewed and may need to be altered according to the child's growth. There is often a problem of accessing healthcare and medication in SA. These problems, although not always easy to solve, must be addressed in patients presenting with disease flares. SLE patients are at an increased risk of infections - these should be actively sought for in any patient presenting with a disease flare. The only available instrument for measuring disease damage is the SLICC/ACR Damage Index, which looks at both disease-specific and non-disease-specific damage and quantifies non-reversible cumulative damage that has occurred since the onset of the disease. In SLE, there is a bimodal pattern of mortality, either from initial disease activity or from complications relating to either the disease itself or therapies used in the treatment of the disease. Renal disease is one of the major poor prognostic factors. Recent improvements in early diagnosis, recognition of milder forms and improved management strategies account for the improvement in mortality in cSLE. In 1981, the 5-year survival rate for cSLE was reported as 82%, but in some more recent studies this figure has increased to 95%. According to Wadee et al., the 5-year survival probability was between 57% and 72% in SA adults. This was thought to be due to an inherently more aggressive disease pattern in black Africans. All SA children with SLE should be referred to a paediatric specialist. If the distance to travel is too far, a telephonic management plan should be made with a paediatric rheumatologist or nephrologist. A paediatric rheumatologist, nephrologist or paediatric specialist with an interest in lupus should see the child as soon as is feasible. Lupus in children is a rare but serious condition. Recent updates have shown that SLE is being increasingly recognised in southern Africa, particularly in black African children. In childhood SLE, there is a higher proportion of males affected than in adult-onset disease. In SA, children present with severe disease, and renal involvement is common. The management of cSLE needs to have early specialist input, and there should be access to a MDT. SLE is becoming increasingly recognised in black SA children. In SA, children present with severe disease, particularly with renal disease. Every patient with suspected lupus should have their urine analysed for protein and blood. A structured approach to investigation and management can help the overall care of the child. All children with SLE should be referred to a paediatric rheumatologist, nephrologist or paediatric specialist with knowledge of cSLE. A multidisciplinary approach to management is essential. ACR criteria. http://www.rheumatology.org/Portals/0/Files/1997%20Update%20of%201982%20Revised. pdf (accessed 13 November 2015). SLICC criteria. 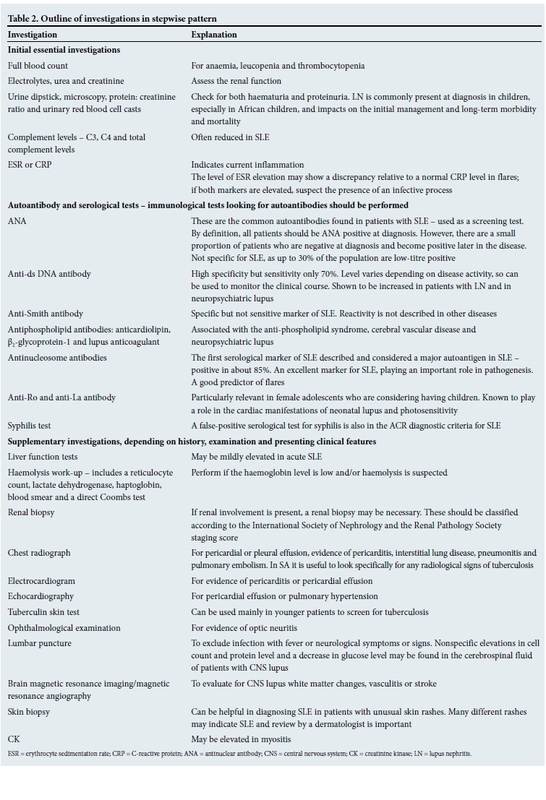 http://www.rheumtutor.com/2012-slicc-sle-criteria/ (accessed 13 November 2015). SLICC/ACR Damage Index. http://www.ncbi.nlm.nih.gov/pubmed/10685799 (accessed 13 November 2015).